THE Official Luke Johnson Blog - "chatter chatter chit chit here we go"
I liked Siri. I love the Apple Watch. So it's been about 24 hours. Here's the thing: I was the guy that used Siri. I'd be on a dog walk and I'd ask Siri to read me a new message. I'd be driving the car and I'd use Siri to remind me to watch a movie later that night. I used what I thought was one of the most useful tools out there ... all the time. I've come to learn that I'm the only person on the planet that used Siri. 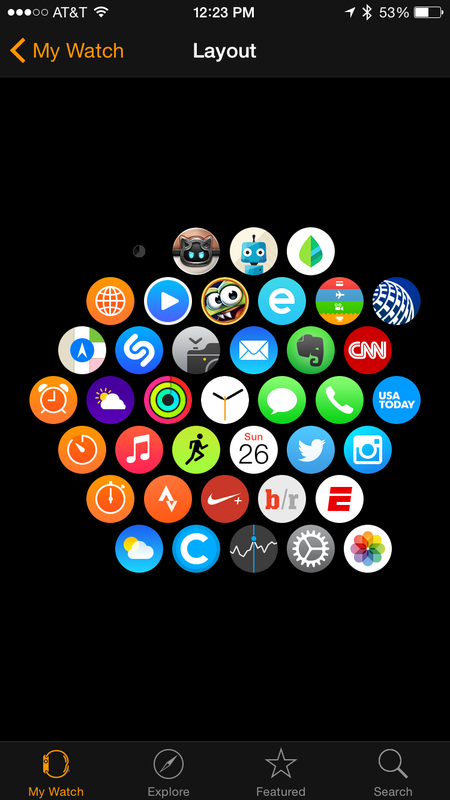 And the Apple Watch is a very useful and very accessible visual version of Siri. Getting an update and seeing it quickly on your watch is as fantastic as I thought it'd be. As much as I love my phone ... and I use it all the time, I really do like the idea of keeping it in my pocket more often. The watch allows you to do just that. Get a wrist tap (and a sound too if you like). If it's an update from ESPN, read it and hit dismiss. Or don't even read it. Just lower your wrist. If it's a text or something you want to respond to, quickly respond by dictating your response aloud. Or by choosing from a pre-set number of quick responses. (You can also set up your own quick responses by the way). Phone stays in pocket throughout. And your phone doesn't even bother lighting up assuming you get the update on your watch. The phone and the watch are pretty much one device. One is not a copy of the other. 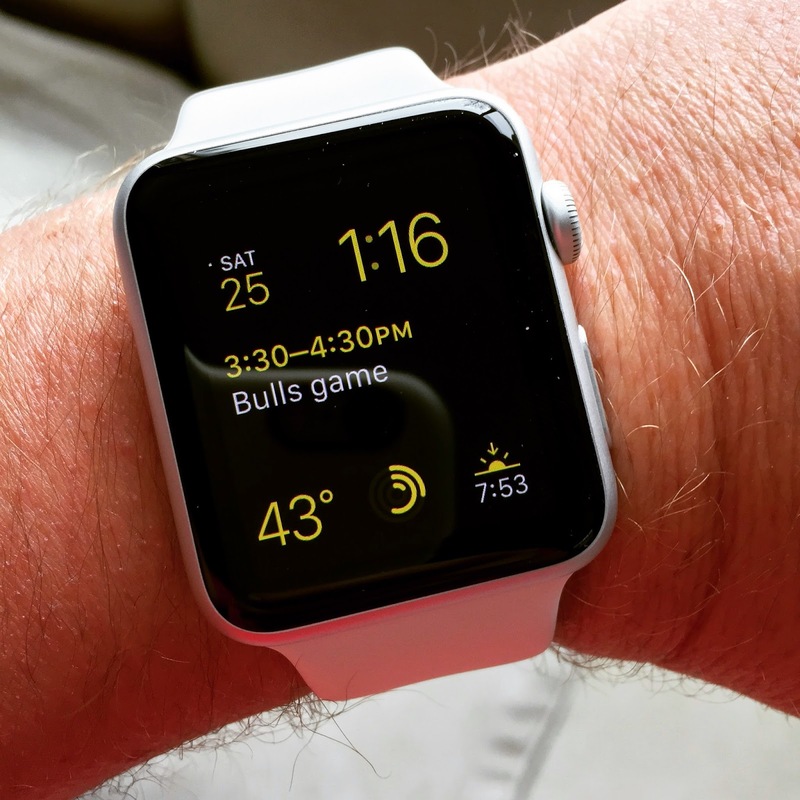 Siri on your wrist is even better than Siri on your phone. 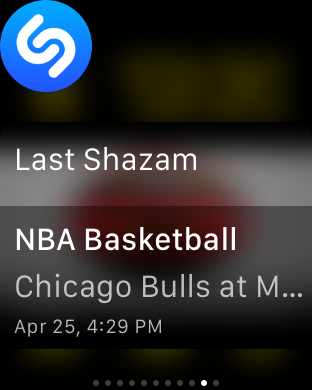 I know no one uses her, but you can simply raise your wrist and say "Hey Siri, set my calendar for the Bulls game tomorrow at 5pm." Then press OK.
And that's that. The calendar is set. No need to pause in between "Hey Siri" and whatever you're going to say. No need to listen to Siri dictate it back to you. No need to press anything at all to engage Siri. I'm begging you people. Use Siri. If not now, when? Customization overload. In a good way. This is the screen that allows you to customize the "modular" watch face. 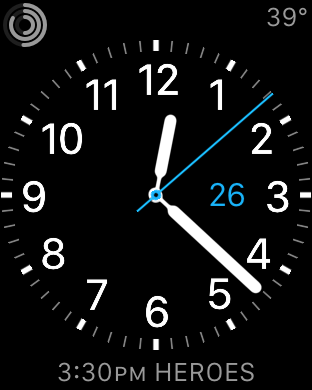 All of the gray boxes can be set to whatever you want: calendar, date, temperature, stopwatch, activity, battery life, world clock. It's fantastic. Only issue is I can't figure out the perfect item for my lower right box. What's more ridiculous than first world problems? 0th world problems? And that's just the one watch face. There are many to choose from. I'd consider using a lot of the available faces. And you can color coordinate each face. I like the blue for the second hand on the face above. 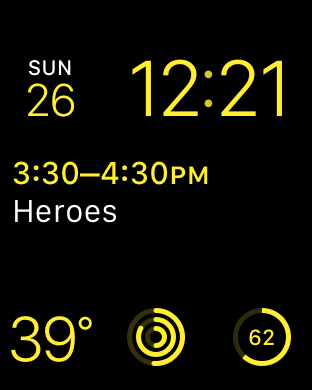 And yet I like yellow for the "modular" watch face. The apps and features are mostly great. If not a little clunky here and there. You kinda get that nostalgic feeling of using the iPhone 1 here and there. In such cases, I recommend just removing that app from the watch and waiting for an update. Some apps really make sense though. 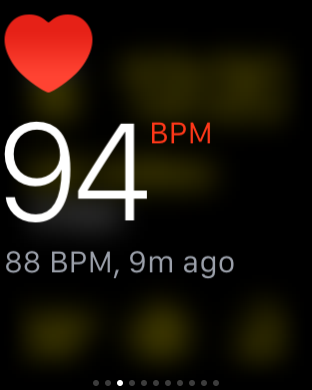 I love having the ongoing heart rate tracker. Not pictured, but also awesome, the watch dings if you've sat around for too long and reminds you to get up and move around for a couple minutes. It also tells you "Hey, you're good. Sit on back down." 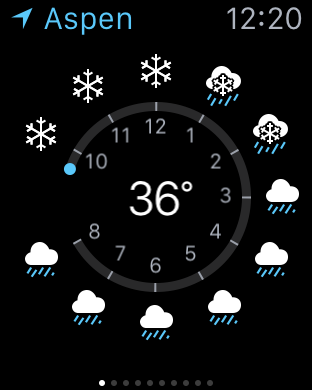 You can always have the temp on your watch face. Clicking it though brings up the hourly which I think is laid out really well. Shazam. The watch is perfect for it. No more awkwardly holding your phone upside down in the direction of the speaker. Bonus: Shazam can even hear what TV show you're watching. 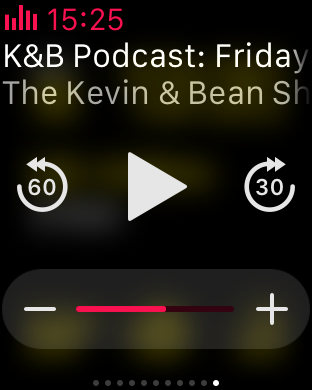 Not advertised clearly, but the "What's Playing" glance can control music, podcasts, 3rd party apps (like Downcast) nicely ... you can control whatever is playing. The iPhone app is required for making serious updates to your settings. Not that I mind that. It makes a lot of sense. I mean, you *can* update the settings on your watch, but why ... when a great full phone size interface is waiting. 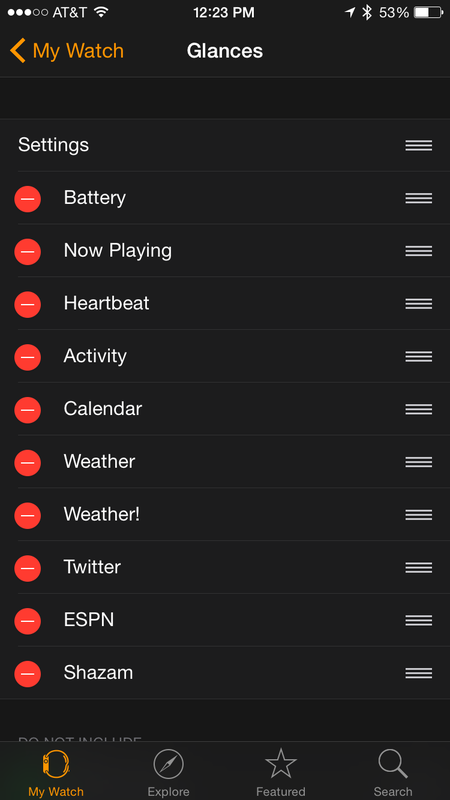 Easily move your apps around and put them where you want them. Adjust which apps use "Glances" on your watch ... the feature that you can access at any time by swiping up from the bottom. And then view the latest score, tweet, weather, etc. Battery life is *NOT* going to be an issue. Maybe it's just because I'm fussing over my watch wayyyyyyy more than I will be down the line, but my watch is at 59% at 1pm. I woke up at 7am. Did quite a bit of app updates and settings adjustments while watching Chelsea. Used the watch to track a 3 mile walk with Steve. I think I'll have to take the watch off before bed time to charge it. Maybe I'm wrong. We'll see. Oh and your iPhone requires a constant bluetooth connection to the watch in order to take advantage of all the functionality. My iPhone battery life was at 60% after the dog walk. I'm charging it right now. Which is a bummer because I recently remarked on just how amazing the battery life was on an iPhone 6 with iOS 8. I was battery-life-carefree for months now. Looks like those days are over. 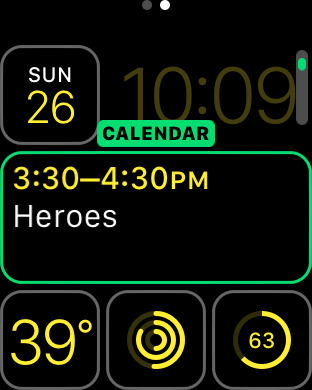 Seems the watch will put me back into battery watch mode. Hopefully software updates can help with this. We'll see. This is the only major downside I've found so far. Which I could certainly see being enough of a reason for a potential buyer to become ... not a potential buyer. Turns out I was way off about the battery - both for the iPhone and the watch. See my updated post here. Obviously *I* love the dang thing. However, if you don't think the watch is for you, it probably isn't. Trust your instincts. Battery life is potentially a big problem for both the watch and the phone. And certain apps are downright not ready for use. But, as an "Apple Guy" that likes to stay current, I'm in. I mean, just look at it! This is a Flickr badge showing public photos from johnsonl33. Make your own badge here.